Summer is kokanee time in Northern California and some of the best fishing is happening right now at Stampede Reservoir near the town of Truckee. You would be hard pressed to find anyone more in tune with this fishery than Captain James Netzel of Tightlines Guide Service. The Fish Sniffer caught up with Captain James for a quick kokanee Q&A on a number of varied topics. Fish Sniffer: What has the kokanee fishing been like so far this season in the Sierras? Captain James: It’s been better than expected. We’re getting bigger fish earlier in the year than we’ve had in the past few years and they are only going to get bigger. We’re seeing fish over 17” right now. Depending on the number of clients, we’re getting limits by 10am on a regular basis. Stampede has a lot more boat traffic than in past years, it’s the number one lake in California for both size and quantity so a lot of people are coming up here. An added benefit is that when it’s 100 degrees in the valley, its 80 up here. FS: How do you see the fishing developing as the summer progresses? CJ: The fish will definitely continue to get bigger and they’re easier to get in the boat because their jaws start to toughen up. As time goes on they’ll start to really school up so you can’t go anywhere to catch fish. It helps to be on the water every day to know where the schools of fish are at. I’ll guide for kokanee until mid-September then I’ll make the switch to Sacramento River salmon but you can still catch kokanee all the way into October. FS: What can clients expect to learn if they book a trip with you? CJ: They can do as little as they want or they can do as much as they want. Generally, I have the clients put the corn on the bait and set the rods out. Most of the time I like to operate the down riggers. They’ll learn how to fish kokanee at different times of the year and if they own a boat they hopefully will become more successful. I have a lot of clients that come up here and do really well. It’s basically a hands-on seminar. On the other hand, if you want to just catch fish all you have to do is reel them in. It’s great for kids because there are so many fish. There is very little down time between bites and there are a lot of double, triples and quads. And your catch will be cleaned and dressed and ready for your trip home. FS: I have seen on social media that you are using some new tackle this season, can you tell the Fish Sniffer Readers about it? 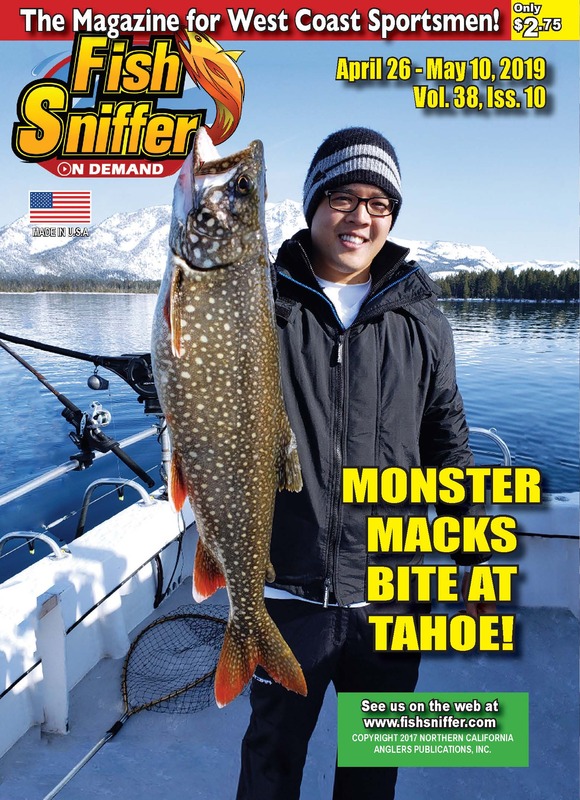 CJ: I’m using Paulina Peak Tackle and I really like their micro hoochies. They work well up here and they come in many different colors. They come with Gamakatsu hooks which are very sharp. Dodgers come prebent so you don’t have to fuss with them. They work correctly right out of the package. The Purple Haze micro hoochie has been at the top of my list. It’s been hard to find in the stores because they have been selling out as soon as they get them, but you can get them on line at www. paulinapeaktackle.com. Purple Haze, Lemonade and Cotton Candy and Orange Moon have been by top colors. I always match my hoochies to my dodgers. FS: Can you tell us about the type of line that you are using? CJ: I switched to braid mainline a few years ago from monofilament. I did a little test, I ran half my rods on braid and half on mono and I caught just as many fish with braid. Braid is so sensitive. You can tell even when you get a small 3” kokanee on, you can see the bite whereas before with monofilament there’s so much stretch you could troll around and not know you had a fish on. I also like braid for trolling because it is smaller in diameter than mono. The 25lb FINs blue 40G line that I use has the same diameter as 4lb mono so when I am trolling with down riggers there is not as much blow back. 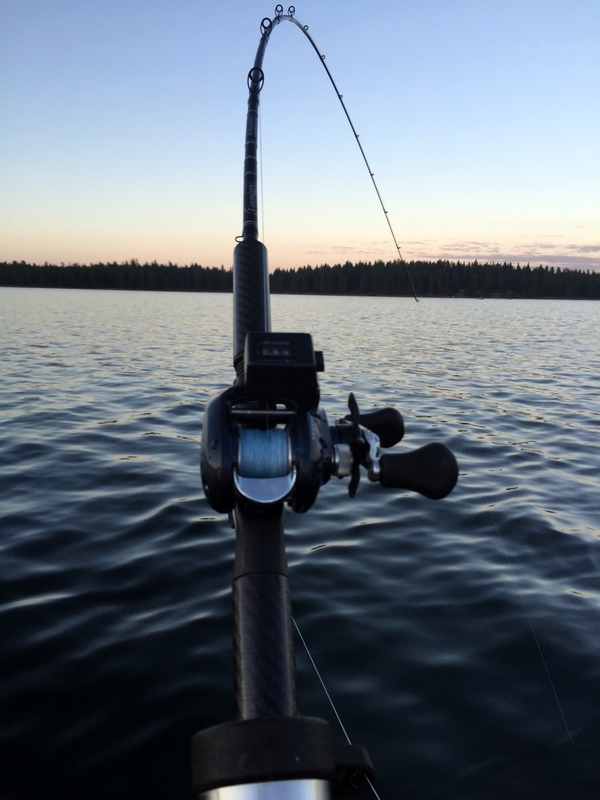 I do use a 30′ top shot of 12lb Gamma fluorocarbon line just to make it invisible in the water. I also use FINS 150 lb. downrigger braided line as well on my downriggers. It is quieter and it is a round line unlike normal down rigger line which is a flat line. 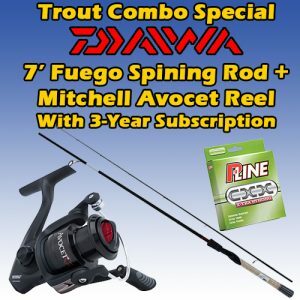 FS: Can you tell us about the specialized rods you are using? 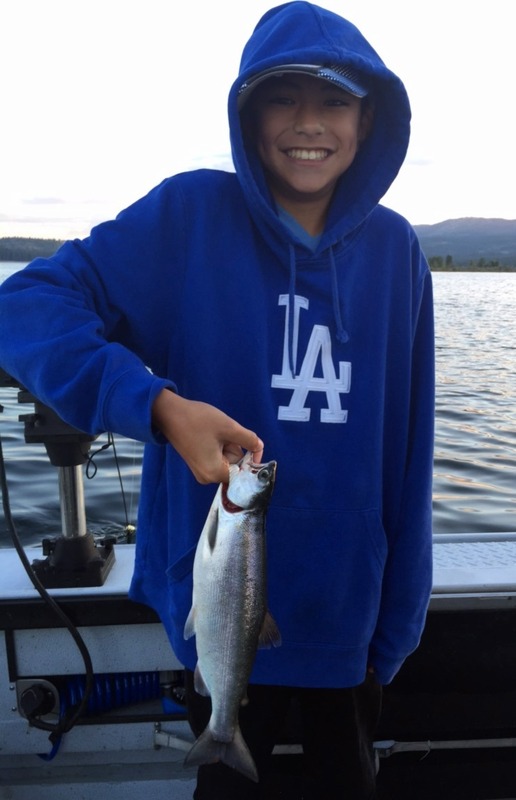 CJ: I use Cousins Tackle Kokanee Composite Rods (7’9” KC790-2TG). They are specifically designed for down rigger fishing. Super light tip so that you can see the bites and you can fight the fish well but with a strong back bone section to control the fish. The problem with most rods on the market today is that they are too stiff or too limber, they don’t have enough back bone. You get a big fish on and you can’t control it. 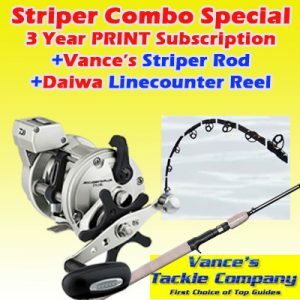 FS: What are the advantages of using a line counter reel? CJ: I like having all my set backs on the down riggers to be the same for each rod. If you have different setbacks, when you hook a fish and it comes to the surface you get caught up more easily. 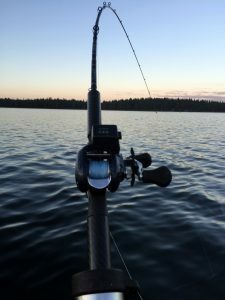 I set all my rods back 35′ that way you don’t get as many tangles and they are back far enough that if you see a fish on your fish finder you can raise them up or lower them to the proper depth and still get the fish. FS: What is the real scoop on your secret corn recipe? CJ: That is a trade secret. Corn is important because it holds whatever scent you are using. I use shoepeg corn because it has a smaller kernel and stays on the hook better. Some guys use plain corn without any scent but I always put a scent on it. I have a secret additive in my corn. Kokanee don’t eat your lures because they are hungry, kokanee eat plankton. Corn and micro hoochies look nothing like plankton so you are using something to make them curious or irritate them to bite. Tuna is one of my favorite scents, I don’t know why but they bite it. As far as my trade secret, I can’t tell you, it’s like the magician’s code (chuckles). Thanks to Captain James for participating in our Q&A. If you would like to book a trip or learn more about Tightlines Guide Service, please call 888-975-0990 or visit www.fishtightlines.com.